Measuring about eight feet long and six feet wide, this 15 year old stand of Russian Sage makes a bold statement in spring. These plants are in an area that gets very little care. Water can be sporadic and infrequent. Obviously, this is one tough plant. It adapts to many kinds of climates and has great tolerance to cold. 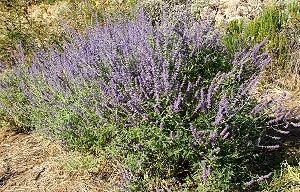 Here in the arid west, Russian Sage starts blooming mid to late spring; in colder areas it may not bloom until the heat of summer arrives. We cut our flowers back once or twice each season and within no time we have a new stand of gorgeous color. In our zone 8 climate, Russian Sage becomes dormant in winter, losing all its leaves, and resprouting on the old wood again the next spring. In colder areas, it may die back all the way to the ground. Flowers may be pruned any time, but it is best to wait and see what resprouts in the spring before pruning branches. Russian Sage makes a nice companion plant for lavender. It continues to bloom after lavender is finished, giving our gardens the lavender hue well into fall. Try planting it with Chocolate Scented Daisies. The yellow of the daisies is a striking complement to the vivid purple flowers of the Russian Sage. 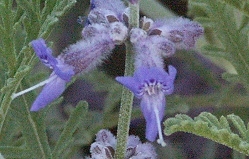 Sometimes called Siberian Lavender, this plant is neither a sage nor a lavender. Its leaves do have a powerful sage like scent and its flowers do have a shape like real sage flowers, but it is not a replacement for Garden Sage and should not be used for cooking. This big bumble bee is trying to figure out this little Russian Sage Flower. In fact, Russian Sage is a favorite of our summer bumble bees. It is quite a display to see the yellow bees swarming around the purple flowers. Russian Sage would make a great addition to our Wildlife Herb Garden Six Pack.